Japanese battleships; the list of them is a long one: the Mikasa, Kongo, and the Nagato among others. Notice I didn't mention the Yamato or her sister ship the Musashi. They will appear in due time. The first Japanese battleships were built by ship building firms in Britain. For those of you who didn't know it, there was a close connection between Britain and Japan pretty much from the 1860s to the 1920s. Japan was seen by the British as a counterweight to Russia in the far east. Britain and Russia were inveterate enemies for most of the 19th and early 20th centuries. So to the British a strong and well armed Japan was a good thing to have next to the Asian continent. The above is pretty amazing given the fact that the British navy attacked the Japanese port of Kagoshima in 1863. The British fleet burned it to the ground. This pointed use of a modern fleet was the last part of a wake up call to the Japanese if they didn't want to end up like China. The Japanese would have to join the modern world. By the 1870's the world had two undisputed leaders in land and sea warfare, Germany and Britain. The Japanese wisely based their fledgling Army on Germany's and their Navy on Britain's. Japan as an island did have somewhat of a seafaring tradition, but this was mostly of a coastal and fishing nature. In the beginning the Japanese had to start her Navy from almost nothing. She had no modern docks or shipbuilding facilities. So again, she naturally turned to Britain. Strangely, the British firms at the time were able to produce better or more battle worthy ships than the British Navy employed at that point. The book itself starts with a background history of Japan's sudden awakening to the outside world. It then continues with the birth and setup of the Japanese Navy. The first battleships brought to our attention are the Katori and the Kashima. These two were ordered in Britain from the 1903 Japanese Naval budget. These ships were based on the battleship King Edward VII. Oddly, though the ships were built in Britain, their armor was made by Krupp in Germany. The first battleship built in Japan was the Satsuma, although her armament and armor was purchased outside of Japan. The book then goes into how the world's navies were put on their ears by the advent of the British battleship Dreadnought. As a matter of fact, all battleships were then classified as either Dreadnoughts or pre-Dreadnoughts. That is how revolutionary her design was. The book shows you the planning and building of Japan's only battlecruisers the Kongo, Hiei, Haruna, and Kirishima (these were updated in the 1930s to fast battleships). The first Japanese 'super- Dreadnought' to be built was the Fuso. The Battle of Jutland and the naval clashes during World War One caused the Japanese to come up with new designs. The design they came up with were for the Nagato and here sister-ship the Mutsu. They were arguably the 'best battleships' in the world from 1920 until the end of the 1930s. Some will immediately argue that position for the British Hood. However, she was in actuality built as as a battlecruiser and not a battleship. The Hood's lighter armor would be tested in 1941 and was found wanting. The book continues with the plans for Japanese battleships before and after the Washington Naval Treaty. This treaty was signed in 1922 by all of the major powers. It was supposed to have stopped the world-wide naval arms race that was happening at the time. It goes on to show the plans for the battleships that were either scrapped or converted to aircraft carriers. The Washington treaty had few clauses about aircraft carriers. Their usefulness in 1922 was not recognized as being worth limiting them. The book goes on with the planning of the three largest battleships ever made, the Yamato, Musashi, and the Shinano ( the Shinano was converted to a carrier after the Battle of Midway). It also shows all of the plans for even larger battleships, with the planning going to the year 1950. The year 1941 saw the age of the battleship come to a close. The last titans of the era, the Yamato class battleships and the USA's Iowas, never battled each other. In fact, both of Japan's super-battleships were both sunk by lowly airplanes. This is my second Kagero book and I am even more impressed than I was with the first one. The book is jammed with photos and even has double paged 3D computer generated foldouts of some ships. 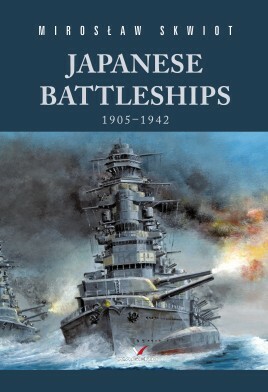 Visually stunning, and filled with all there is to know about Japanese battleships, this book is very easy to endorse.